Of late, companies seem to be introducing models without any fanfare – one such example is Mercedes-Benz Malaysia’s newest C-Class variant, the C 180 BlueEfficiency. The car slipped in unannounced, popping up recently on the company’s website in quiet fashion. The cheapest W204 rolls in at RM227,888 on-the-road without insurance, 35 grand cheaper than the C 200 CGI in its Elegance specification level. The introduction of the variant is not with the 154 hp and 250 Nm 1.6 litre M 270 DE 16 L that has just gone on the C 180 BlueEfficiency in other markets, but with the same 1.8 litre mill as found on the C 200 and C 250 CGI versions here. In the case of the C 180, the DI turbocharged M271 DEH features an output tune of 156 hp at 5,000 rpm and 250 Nm at 1,600-4,200 rpm, identical to that on the C 180 Coupe. Performance specs for the 1,495 kg offering include a 0-100 km/h sprint time of 8.9 seconds and a 223 km/h top speed, and like its siblings, the C180 wears a 7G-Tronic seven-speed transmission. As to be expected, there’s some omission of kit – the C 180 is missing the speed-sensitive steering, bi-xenon headlamps and electric rear screen roller blind found on the C 200, among other things. There’s ECO start/stop in the mix, and the dampers set-up on the car is the same as that found on the C 200 Elegance variant. Inside, the variant features a black or grey interior, with Artico leather upholstery and piano black trim (the C 200 features high-gloss burr walnut trim on the Elegance and aluminium on the Avantgarde). The C 180 rides on 17-inch alloys like the rest of the range, in this case a five double-spoke design. wow! now lets see how the BMW respond. Heard BMW going to have some new variant of X1, facelift 5..also the F30…see how they price now…hahahah…BMW in trouble now..
Yeap, all of you have good points there. The C180’s entry into the field is timely, and in fact, still good value, despite all the stupid taxes pounded onto this car. No 3-Series to drive, but more comfy, more spacious, and most importantly, undercuts the upcoming 320i by a huge margin. BUT, when the 320i comes in, it has a few major advantages, in particular it’s more powerful engine, as well as the easier to use iDrive compared to the COMAND system in the C180. why not compare it to 508 GT Station Wagon?? I would say all the three BMW, Merc and VOLVO are beaten hands on. Your Peugot can never compete with Merc, BMW and Volvo. Its not a premium car and it will compete well with VW, Toyota, Honda, Nissan, Ford, etc. Agreed.There’s no reason at all for merc to price their cars lower just to fight with T & H.
its already happening now….some ppl think their mighty camry is better than a merc/bmw. Whats idiots think T & H or even a Pug is on par with Merc…. Cannot afford one actually is ok wan, no one will blame u…. just don’t try to be smart and compare them the same la! Ha ha, so are you driving a Proton? You seem proud, cool! But available petrol is Euro2M RON95, so all engines mentioned are detuned to use Euro2M fuel. Thus emissions are sadly not as specified. Cheap, good for ladies with heavy daily usage. no eco start stop function? The volvo s60 t4 is a better buy. its the cheapest s60: YES. but feature wise compare to C180 this Volvo is far behind with no dynamic damper. Can you don’t compare T&H also VW with luxury brand? Skoda is even a useless car. It can’t even compete with Toyota, Honda, VW and Peugot and you want to compare it with the luxury brands. Get your facts right first before commenting. c180 is popular in sg. i think this new c180 will bring a lot of new merc customers. In SG COE above 1.6l is much more expensive … that’s why! Turunkan harga kereta. This would cost less than RM112k since the cheapest C-Class in the US is the C-250 (201 horsepower) selling at USD$36k (RM112k). If you want to pay higher, go ahead, no one is stopping you. Like the 3 pricing schemes we have now (peninsular, sabah-sarawak, langkawi/labuan), we will replace it with 2 pricing schemes (BN high price, PR market price). Your choice. The car price without tax in Malaysia is actually 209K. Just look at MM2H prices. Nobody on the world will get car prices similar to the US. Cars in UK, Japan and Germany are way more expensive. yes, i always agreed on the prices to differenciate luxury. Does it comes only in Elegance ? Avantgarde is so much nicer. It’s a single specification level, with no Elegance or Avantgarde suffix. Is there a difference in Blue Efficiency and CGI esp the engine ? can always change the grille to c200 avantgarde one. loads of accessories for c class. Does it comes wiht built-in GPS? The leather is a grade lower than the C200, rims are different and the electric seats do not come with memory function. Like someone mentioned above, the Volvo S60 offers a lot more kit comparing to Merc and BMW so if u wanted a car with the latest tech u won’t be buying a Merc or BMW. Bro, if not mistaken, the leather in the C180 is the ARTICO man-made leather, hence the differences in leather feel. Any GPS in-built into the C180? The next STEP by C & C is to bring in the C Class 1.6 CC with 156Bhp.. 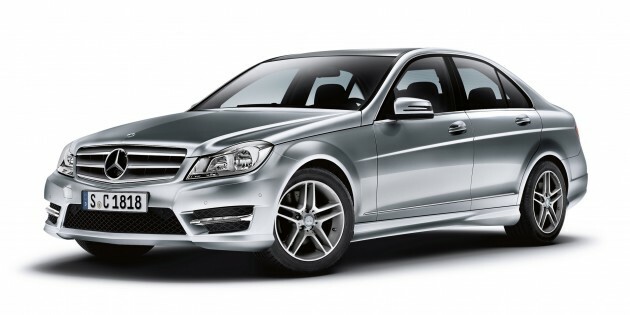 Selling price RM 168,888 W/O insurance..
C class has a nice sporty Front design, ..but Rear is ugly ! I don’t know why.. every time I am about to buy a car.. that model is about to end and new model coming which definitely I cannot afford the price..
talk is cheap, why wait then, simply just go get it. than spam in c180 section. Each individual has own judgement and choice of BRAND liking also purpose of purchase, go for higher end if budget allowed or tighten $ spend on car. nothing is wrong with it. your $ your choice..
for me, c class is an overall car known for its reliability suits for daily use. for those chose to drive mercedes.. check out kleemann, carlsson tune, great value for money to boost up its hidden potential. i am amazed for its 230hp from an c200k and happy with $ spent on. I was comparing C200 and C180 specifications and found out that a number of equipments missing in C180 than already mentioned by Anthony, like Electrically adjustable front seats with memory function, Electrical folding and adjustable exterior mirrors, Auto dimming interior mirror & driver’s side exterior mirror,Eco Start/Stop function and auto high beam control. Appreciate if anyone can comfirm.